Tokyo- and Singapore-based mobile media platform Cinemacraft announced it has extended its Series A round by securing an investment from Dave McClure‘s 500 Startups. The fresh money from the US brings the total amount raised by the company so far to US$900,000. Previous investors include Singapore-based Jungle Ventures (background), Jayesh Pareikh (founder of Sony Entertainment TV), Jai Maroo (Shemaroo Entertinament), Takuro Wakayabashi (Xseed Partners), and Devesh Chetty (RGM Media). Cinemecraft founder and CEO Sandeep Casi says the investment will be used to create an interactive video ad network in Japan, US, India, and Indonesia, along with ad-supported consumer video apps. 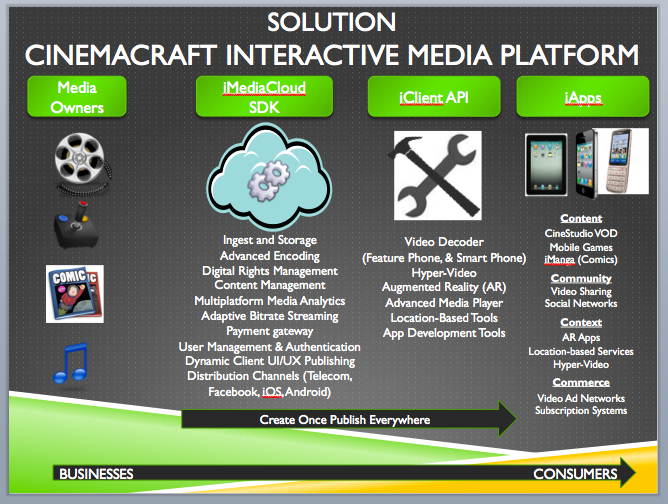 For Cinemacraft, this is just a first step: the company is currently building an interactive mobile broadcast network that will make it much easier to distribute video and other content to mobile devices, including feature phones in emerging markets. To be more concrete, the cloud-based platform makes it possible to stream rich media over 2.5G (30 kbps to 60 kpbs), 3G (100 kbps to 250 kbps), 4G (over 300 kbps), and Wi-Fi/broadband (400 kbps to 1000 kpbs). In other words, Cinemacraft wants to enable even owners of low-end phones in mobile markets with weak bandwith and latency issues to consume content such as movies, TV programs, music, games, comics, or interactive video ads on their handsets. (Again, smartphones like the iPhone or iPad, Android, Windows Phones, or Blackberry are supported, too.) The ultimate goal is a unified interactive media platform that overcomes the fragmentation problem observed in the mobile world today. Cinemacraft is looking at a big market: according to Cisco, worldwide mobile video traffic in 2011 has exceeded 50% for the first time and is projected to hit 66% in 2015. The startup is currently building out its entire media broadcast platform, i.e. the compression technology, the video streaming technology, and the media players (see below for an overview). You can learn more about Cinemacraft’s background and history here.